Cheshire Scientific microbiological and chemical analysis of water, feeds, pharmaceutical, cosmetic and environmental products. 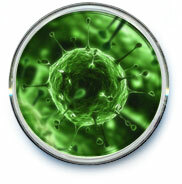 A virus is unlike many of the other microorganisms we look at in that it is unable to reproduce outside the host cell. Viruses quite simply consist of genetic material that hijacks the host cell. Many types of virus have been and continue to be very serious pathogens of both animal and plant species. Examples of important viruses include HIV (the aids virus) and the smallpox virus. If you are an existing client and would like further technical data on viruses please contact the lab for instructions on how to access and a passcode which is required to obtain this information.